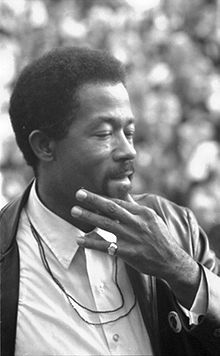 In the late 1960’s, after leading a troubled youth, Leroy Eldridge Cleaver became a prominent member of the Black Panthers. Having held the titles Minister of Information, Head of the International Section of the Panthers while in exile in Cuba and Algeria, and as editor of the official Panther’s newspaper, Cleaver’s influence on the direction of the Party was rivaled only by founders Huey P. Newton and Bobby Seale. Cleaver and Huey Newton eventually fell out with each other over the necessity of armed struggle as a response to the FBI’s Counter Intelligence Program and other actions by the government against the Black Panthers and other radical groups. While Cleaver advocated the escalation of armed resistance into urban guerilla warfare, Newton suggested the best way to respond was to put down the guns, which he felt alienated the Panthers from the rest of the Black community, and focus on more pragmatic reformist activity. In 1968, Cleaver was shot during an ambush he initiated against Oakland police officers, in which fellow Black Panther member Bobby Hutton was killed and two police officers were injured. Charged with attempted murder, he jumped bail and fled to Cuba and later to Algeria. Following Timothy Leary’s Weather Underground assisted prison escape, Leary stayed with Cleaver in Algeria; however, Cleaver placed Leary under “revolutionary arrest” as a counter-revolutionary for promoting drug use. Cleaver later fled Algeria and went underground in France. Cleaver returned to the United States in 1975, having become a born again Christian, and renouncing his ultra-radical past. The charge of attempted murder, stemming from the armed Panther attack on Oakland police in 1968, ended in Cleaver being sentenced to probation for assault. In the late 1970’s, he joined the Mormon Church of Latter-day Saints. Once his probation ended, he was baptized into the Church of Jesus Christ of Latter-day Saints on December 11, 1983. He periodically attended regular services, lectured by invitation at LDS gatherings, and was a member of the church in good standing at the time of his death in 1998. Cleaver argued that the Mormons were among the few religious groups who, as an entity, did not propagate slavery. He simply found the claims that the Church was a “racist institution” to be unconvincing. Furthermore, Cleaver identified with Joseph Smith and with the ideas of a literal relationship to God as children, not as creations. He appreciated how seriously Mormonism took the written scripture. Along with Cleaver’s theological conversion came a political conversion. By the 1980s, Cleaver had become a conservative Republican. He appeared at various Republican events and spoke at a California Republican State Central Committee meeting regarding his political transformation. He began lecturing on college campuses, promoting conservative issues and campaigned for then presidential candidate Ronald Reagan. In 1984 Cleaver ran for election to the Berkeley City Council but lost. Undaunted, he promoted his candidacy in the Republican Party primary for the 1986 Senate race but was again defeated. I can identify with Mr. Cleaver on several levels, although my life has been somewhat less dramatic. I grew up in the era. I was born in Detroit, Michigan in 1960. My father was a pioneer in the day, he was just completing his Master’s Degree when I came along. In 1964, my family headed for California, where we resided about 80 miles from Oakland. I remember the times. I remember the struggle. Cleaver’s transformation was similar to my own. When my eyes finally opened, I came to know that, “… we are not fighting against flesh-and-blood enemies, but against evil rulers and authorities of the unseen world, against mighty powers in this dark world, and against evil spirits in the heavenly places (Ephesians 6:12).” Once I understood, I embarked upon my own spiritual journey. I ran with the Baptists, the Pentecostals, the Seventh Day Adventists, the Christian Scientists, then back to the Pentecostals. I just never made it to the M’s, yet. In the early 1980’s, I too became a Reagan Conservative. Groupthink forever ceased to be my forte. Freedom requires an open mind. ‘The connection between people and between Creation and the creator is not a political connection, it’s not an economic connection, it’s a spiritual connection.’ I choose to live free. Today, I am an independent conservative, I am Christian, I am American, I’m Black, and I’m proud. Right On, Eldridge, Right On! Mr. Gingrich said that any such plan must (A) start with securing the border, then (B) establishing a guest worker program, and finally (C) setting up a board to review the status of each person here illegally. Such a board would distinguish between those who recently came here, and those who are more established. He said that those who recently came here, who don’t have family ties, or are otherwise not established, should be sent home. While those who are established, who have been here for 25 years or more, who have children and grandchildren in America, who belong to churches, who have obeyed the laws, and who have paid their taxes, should be allowed to stay legally, but not automatically granted citizenship. For the latter, he recommended using something similar to the Red Card Solution, which would be used as a form of identification, to grant legality, but not as a path towards citizenship. Gingrich also recommended that H1 Visas be granted with every graduate degree in math, science and engineering, to encourage foreign students to stay in America. For the most part, I concur.